"Know, Know, Know Your Goat"
If the Stan Against Evil premiere was all about Stan, “Know, Know, Know Your Goat” looks to fill us in on the rest of the (admittedly tiny) supporting cast. The main action involves Stan’s oddball adult daughter Denise inadvertently picking up a stray goat-demon while blueberry picking. (In her defense, he just looked like a regular goat at the time.) And new Sheriff Evie Barret winds up retrieving some enchanted salad tongs (like you do) and interviewing Willard’s Mill’s local crazy street preacher about how to dispatch said goat-demon. The problem with sidelining Stan, however, is that a reduced-Stan Stan Against Evil turns out to be even slighter than the sloppy but entertaining pilot. 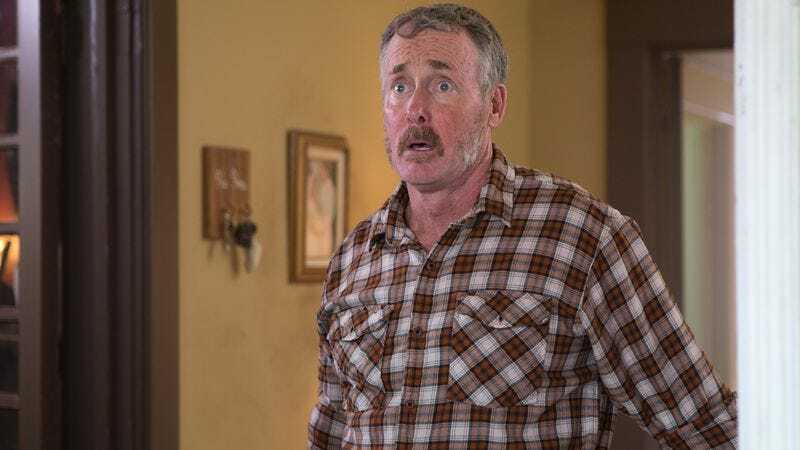 John C. McGinley’s hardly absent here, but his Stan spends the first half of the episode scowling in his retirement easy chair while Denise and Evie do most of the leg-work, blueberry-picking and investigative. And while it’s necessary to spread out the focus onto the able comic actors surrounding McGinley, neither plotline here is really strong enough to weather his absence. If Stan Against Evil is largely a breezy, eccentric riff on the supernatural, monster-of-the-week procedural, it needs McGinley’s showily gruff, often hilarious ranting at its center. Here, the Stan-adjacent scenes just aren’t distinct enough on their own. That’s nothing against Deborah Baker Jr. or Janet Varney, two talented comic actresses who both find disparate ways to flesh out their characters’ eccentricities. Baker is quickly making Denise one of those indelible sitcom oddballs whose seeming dimness obscures the fact that she’s operating on a wavelength out of synch with everyone else. There’s something increasingly endearing about Denise’s relationship with her father, where her weirdness and his natural assholishness meet in a clearly negotiated no-man’s land of mutually affectionate bickering. 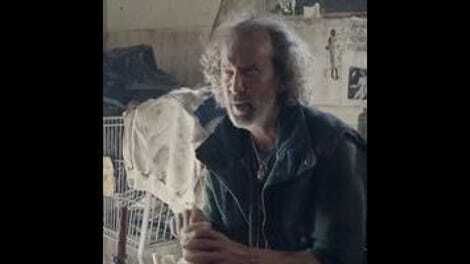 Stan’s exasperated by, say, Denise’s inability to stay with his Jaws analogy when their house in under siege by Baphomet, the trickster goat-demon. (“You can’t be Quint—Quint dies!”) But Stan is overcome once Baphomet’s illusions force him to face a “Shoot us both, Spock” dilemma that might mean shooting his daughter by accident. Stan’s weak, “Oh hi, hon” once he comes to is funny but sweet, as is the little once-over Denise gives herself before responding to his suspicious, “Are you you?” She also measures the duration of his unconsciousness as “Like, microwave popcorn amount of time,” which, along with the impromptu silly blueberry-picking song she sings earlier, is the sort of quirky, lived-in detail that says a lot with a little. As for Evie, Janet Varney, too, brings specific little touches that make her designated outsider/one sane person in town more fun to watch than would seem to be her lot. Confronting town crazy Ray Taft (a slyly funny Don Stallings) as he screams about the coming end of the world, evil goat men, and the like, Evie approaches the encounter with a wry reasonableness that brings out an answering loquaciousness in Ray. Stallings’ shifting between registers is consistently amusing all episode, and, once he sees that Evie’s interested in what he has to say (once she spots the replica salad tongs medallion around his neck), the two build a nice, funny rhythm that lasts right up until the point later where Baphomet bewitches Ray into choking Evie out. (Even then, he utters a series of sincere apologies while in the act.) Sure, this is the second episode in a row where the forces of evil get the drop on the new sheriff, but, hey, they’re demonic forces of evil. Varney gets a lot of mileage out of her forbearing, skeptical head-tilt and brow-furrow, making Evie—tied to a stake or strangled by a possessed loon or not—seem less in over her head than doing her level best against a ridiculous situation. She’ll get the hang of it. On the basis of this second episode, it’s going to be a test for Stan Against Evil to establish a tone. The pilot was both packed and streamlined, introducing the show’s weird world while allowing McGinley’s gabbling, snarky Stan to inform the show’s sensibility. Here, for a 21-minute episode, “Know, Know, Know Your Goat” feels poky. There’s a prologue set in 1954 where a friendly farmer is killed by Baphomet that’s narratively redundant, and a cut to the scene where Evie wakes up to notice Ray (and the tongs) gone is perfunctory and drawn-out to little purpose. While there’s still plenty to like, the series seems content in its second episode to just be the knockoff pastiche it appears to be on the surface, rather than looking to invest itself in crafting an individual identity. Keeping with the Jaws theme, Stan fashions a shark cage (goat cage?) out of a piece of playground equipment, although there’s also a Ripley-in-the-power-loader vibe to the getup as well. The episode continues to drop hints about Stan’s former policing style, with Ray and another townsperson complaining that “Stan never used to”: fine Ray for screaming about the end times, breathalyze people, commandeer vehicles, or worry about hunting licenses. Nate Mooney’s Deputy Leon will have to wait for his turn in the spotlight. Tonight, we only see him on the phone in one scene, apparently trying to negotiate for a Russian mail-order bride.